Zhoukoudian, situated 50 kilometers to the southwest of Beijing proper, is the former residence of Peking man, who lived here approximately 200,000 to 500,000 years ago. Since the discovery of a complete skull on December 2,1929, Zhoukoudian, which had more recently been noted for its production of lime, became world-famous as the "home of the Chinese ape-man." After the establishment of the People's Republic of China, the number of sightseers and scientists increased rapidly, and Zhoukoudian has become a great tourist attraction. Peking Man chose Zhoukoudian as his residence because the limestone caves and crevices in the area provided an excellent habitat. The northern face of Dragon Bone Hill (Longgushan), which stands to the east of the Zhoukoudian Railway Station, is the site of the caves occupied by Peking man; in fact, a total of four early residential sites have been discovered on this hill. Besides those belonging to Peking man, the remains of a site occupied by Hilltop Caveman are the most representative. At present, Zhoukoudian' s Dragon Bone Hill has an exhibition hall, which is divided into seven rooms. The first room exhibits fossil remains of Peking man, stone tools, and evidence of Peking man's use of fire. These exhibits also depict Peking man's external appearance and general living conditions. The second room demonstrates Hilltop Caveman's fossils, stone tools, bone needles, decorative objects and animal fossils. The third room illustrates fossils of man discovered in various parts of China, such as Dingcun Man, Hetao Man, Ziyang Man, Zhalainuoer Man and other fossil copies of the ancient jungle ape, southern ancient ape, Java Man, Neanderthal Man and Cro-Magnon Man that provide an overall understanding of human evolutionary development. The fourth room introduces the geological history of Peking man's residence site and displays the process of human and animal evolution through different geological periods. The fifth and sixth rooms exhibit vertebrate fossils discovered in other locations around Zhoukoudian, including a display of fish fossils. The seventh room contains the fossils of some of the animals hunted by Peking man. Among them, the tiger and bear were considered Peking man's enemies. The discovery of elephant and rhinoceros fossils at the site demonstrates that the climate during the time of Peking man was far warmer than it is today. 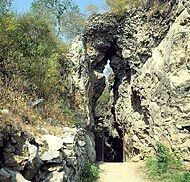 In addition, one can see the actual caves in which Peking Man and Hilltop Caveman lived. The cave at Site No.1 originally measured 140 meters from east to west. Its width was irregular and it had a height of more than 40 meters. The cave was first occupied approximately 500,000 years ago, and it is estimated that Peking Man maintained this residence over the course of a quarter of a million years. The bones of Peking Man discovered in the cave in the hill's north face include six complete or relatively complete skulls, eight skull fragments, six pieces of facial bone, 15 mandibles, 153 teeth, seven sections of broken femur, one broken shinbone, three pieces of upper arm bone, one clavicle and one wrist bone belonging to more than 40 individuals of different ages and sexes. Although the materials are fragmentary of human fossil remains from this particular stage of human development. In addition, 118 animal fossils have been found in the cave on the north face of the hill. It should be noted that with the exception of five teeth, one upper arm bone and one leg bone, all the original Peking man fossil remains, together with those of Hilltop Caveman, disappeared during World War II and have never been recovered. Traffic: Take Bus No. 917 at Tianqiao bus terminus, and then change to a special-line bus at Liangxiang or Fangshan. To drive a car, get onto the Beijing-Shijiazhuang Expressway and get out at the exit of Yancun, then turn right at Zhoukoudian.